This graph depicts the average minute rating* of Olympic Games broadcasts from 2000 to 2008. At the Olympic Games in Athens in 2004 the average minute rating was at 78 million, indicating that 78 million people were watching the broadcast during any typical broadcast minute. 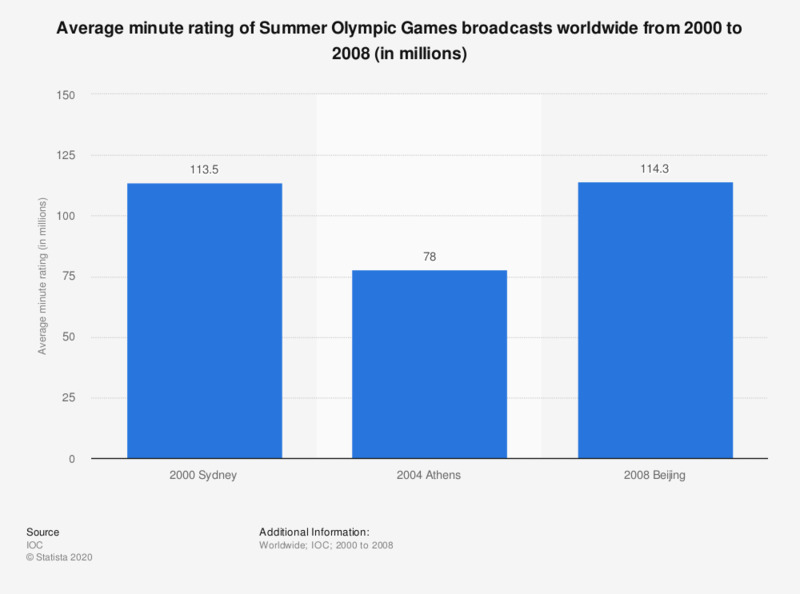 Average minute rating measures the number of viewers watching a typical minute of Olympic Games television coverage. The global figure is calculated by combining the average minute rating of dedicated Games coverage aired by official broadcasters. The rating is based on the viewership in 29 key territories worldwide. Everything On "Olympic Summer Games 2012" in One Document: Edited and Divided into Handy Chapters. Including Detailed References.